AnyMP4 iPhone to Mac Transfer is the most professional iPhone Transferring software, which can transfer all iPhone files such as music, movies, ringtone, camera roll, picture, voice memos, and more to Mac for backup. Also, with this perfect program, you can also transfer iPhone files to iTunes. So it would be your best friend if you own this useful tool. This wonderful iPhone to Mac Transfer software has the ability to transfer iPhone files to Mac computer. And these files include music, video, ringtone, camera roll, picture, voice memo, camera shot, and so forth. 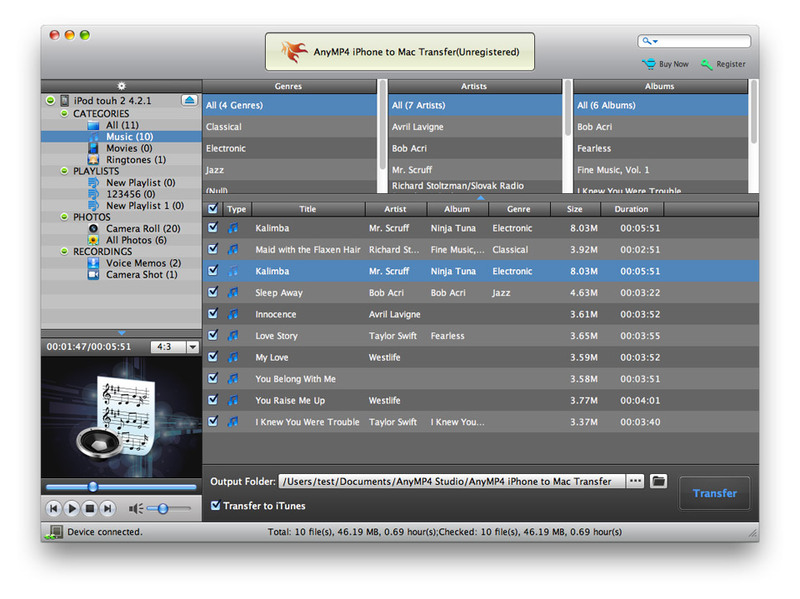 Also, this program enables you to sync iPhone files to iTunes. So it is very practical for iPhone users. This iPhone to Mac Transfer software provides a media player at the bottom of the main interface, which allows users to view the video/audio/picture effect conveniently. Also, this program has very clear interface that can help users operate it easily. And the search feature it owns helps users find the results quickly. capacity, version and serial number in the main interface. This software supports all versions of Apple devices like iPad, iPhone and iPod. So it is convenient for you to transfer Apple device files to Mac computer.